The cover drew me to the book, but it was the story that kept me coming back. Amazon affiliate links are used on this site. A free audiobook from Audible.com was provided for an honest review. 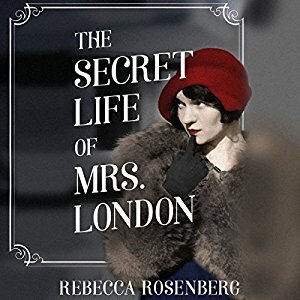 I wasn't sure if I'd really like The Secret Life of Mrs. London since it is set in the early 1900s. But I'm finding that I'm enjoying this time period more than I once thought so I decided I would give it a chance. In addition to the cover, it was the chance to learn more about Jack London that led me to try it. I didn't really know anything about Jack London's life, though I'm pretty sure I read Call of the Wild. It was cool to get an insider look at his life - it was a bit of a grumpy old man. And while the story is focused on his wife Charmain, he was so much of her focus that it would have been difficult not to include so much of him. It is actually this lack of identity apart from her husband that has her unsettled. Since I had little knowledge of Jack London I did a little Wikipedia reading and discovered Charmain was Jack's second wife. Though he had met her before his first marriage it was while he was married to his first wife Bessie that they became romantically involved. In addition to learning about the Londons, we also get a glimpse at Houdini's life as he and Charmain shared a friendship. So that was a bonus. From what I've read on Wikipedia, The Secret Life of Mrs. London is historically accurate. Elisabeth Rodgers, who reads the audiobook, does an excellent job. She really brought the story to life. If you are unsure of listening to audiobooks, this is an excellent book to try. And if you haven't tried Audible yet, you can get this audiobook free as part of your free trial. I thought I might like this book (despite the time period), but I didn't expect to fall in love with it. I listen to audiobooks at work and I found myself staying later each day just because I didn't want to stop listening. In the case of The Secret Life of Mrs. London, a striking cover is just the beginning of the greatness. I highly recommend it.